I am worried about my future. Is that grey in your hair? Should I volunteer for work? Who will look after me as I age? BONZA is an information site or lifestyle magazine for Baby Boomers. We want all Boomers to plan for their future and support each other. More than 20 000 thousand Australian Boomers retire each month now (around 240 000 per year) so welcome to Ageing Australia. What can we do for ourselves if we are a Boomer to prepare for life after work? This site will give you the information you need to change your life. You found us! Now you are here, stay a while..
Are you a Baby Boomer in Australia or New Zealand? Are you researching the Baby Boomers? What was it like to be a Boomer? The editor has written some stories about his life as a Boomer. Hover over ABOUT THE EDITOR above for access. Swedish death clean is a not so common process in Australian culture but it is the process of disposing of your possessions before you die. Our possessions are like our relationships and particularly marriage when some of us promised loyalty until death do us part. I have hobbies and material possessions from my youth, a drawer full of paperwork that is relevant only to me, and containers of important milestones of my life in the closet and all of it will be gone before I go if I can possible do it. All the furniture can be sold, money dispersed, and my photos and awards dumped so I feel organised. How are you feeling about your possessions and are you organised? I upset a relative of mine recently when she managed to have a container load of her mother’s memories delivered to her home. There was enough stuff to completely take up the entire length beneath her raised home and then some more moved into the house. We are talking a lot of memories here as her mother was a hoarder and collected items from her own mother’s past plus the hobbies of her late husband who was a photographer and handyman. Her mother was also an artist of some talent, so the paintings, frames and creative bits and pieces came to with the furniture from an entire home. Crockery, her old cot, diorama of a tall ship, a complete history of furniture from the eighties and nineties, old ports, plant stands, vases and much more. You get it, the whole house was there on display and it was quite fascinating checking it all out as a lot of it should have been in a museum. She was initially overwhelmed by it all, so I offered to put items for sale on gumtree as she went through the numerous boxes and it was an amazing list of antique and valuable items that were found in her journey of discovery. Eventually the more valuable items such as recorded cylinder drums and old gramophones from the 1800’s were set aside for further decision making on their likely future placement and the not so valuable stuff separated into boxes downstairs. Most of the furniture went cheaply on gumtree and it was during this process that I realised what value this had to my relative. She was not happy with just moving it on but wanted top price where possible which is a much longer process. My only dealings with the belongings of my past was my mum’s possessions which the family agreed at the time to take one item each as a memento and sell or dispose of the rest. I also use gumtree to move any items no longer of use currently, so I was keen to sell these newly acquired op shop destined items. Three quarters of the items have now been sold, dumped or given away but my relative is now suffering regrets that she didn’t take longer in the process and may have given away items that could have been items of value to her. Is retirement easy for Boomers? I was never comfortable with retirement and did so with some anxiety as the retirees of my youth had quickly disappeared into God’s waiting room and were never seen again in my eyes. But times have changed and I did retiree with trepidation but without fanfare 12 months ago. So what has the first 12 months been like? The first thing that is worth noting is the time it takes Centrelink to process your Age Pension application. Their argument is that some 20 000 Boomers retire now each month in Australia so that is a huge increase in workload compared to the Silent generation before us so I waited not so patiently for nearly 2 months for a decision even though it is back paid to application date. It is also worth noting that the local Centrelink office is absolutely in the dark with your application and nothing you do will make it go faster at that office as it is processed in age pension land somewhere else nor does the complaints line or the internet make any difference although it is good to vent when you are frustrated. I eventually contacted the Minister’s office and had it approved within a couple of days. I felt a little guilty about this approach but I had no income and anyway, why aren’t more workers hired if the work load has increased? So make sure you apply before your birthday so it is well on the way when you are eligible. It is also worth remembering that you should make an appointment with the Financial Services Officer for a free interview about your eligibility for pension as they have great knowledge that will be helpful to you as an individual. Those retirees of my youth that I previously mentioned all died fairly quickly from my recollection and I am a great believer that their death was from a feeling of rejection and accompanying ageism that killed them off before 70 on average. We are doing much better with the average death age now over 80 so we can look at life on retirement as virtually a second coming. I have a life in retirement and work 3 days a week for 2 hours each day which gives me purpose and income for coffee and breakfast on the weekend at the local café. Also keeps me fit which is the next topic in my year of reflection. The gym 2 mornings a week for toning not body building works well and a healthier lifestyle which includes a different approach to food. Forget sugar if you can as I have been able to maintain a 12 kilo weight loss by eating vegetarian food and have enjoyed it thoroughly so keep an open mind about food. I also walk each day and surf when I can plus some bike riding which is all very enjoyable. Our walks are either local, beach, hinterland or designated ones like the Milford Track which was just incredible. My finances were the next anxiety and I have been able to live off the interest of my superannuation combined with pension and work income as mentioned previously very comfortably while retaining the principle super amount. I have a travel account and the generous interest on super goes into that 50% and the rest for bills and living so we have been able to have a few holidays. If you haven’t yet retired then put as much as you can into your super account as it will allow you through generous interest on your contributions to retire with some dignity and maybe even earlier than you thought if you are a young Boomer. Living is easier for us because we shop for each meal now and therefore have no left overs each week by spending around $150 on food. My social life has been an improvement to previous work life as I have the time to meet regularly with family and friends for coffee at least one day per week which I love doing. You also get to choose who you want to spend your time with as I find I am less patient with difficult people and do not want to waste my valuable time with them. I also meet my grandkids on their birthdays and Xmas and that is rewarding as you watch them grow. My children and mostly settled elsewhere and we communicate by phone now as I found texting was non rewarding as things were taken literally even when you were joking so one huge lesson was that.. Use the phone to talk. I will never be happy being a retiree as Boomers have so much energy and never want to grow old but I will continue editing BONZA, assisting my local councillor with suggesting local change (something he has responded well to) and will keep fit and healthy for as long as I can because none of us can stop the clock so we must make the most of our time we have left. Enjoy your retirement. I am. Submission from BONZA in favour of Voluntary Euthanasia. 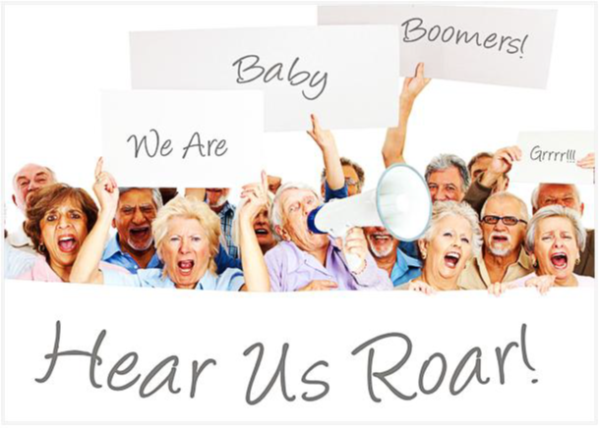 I am the editor of the Boomer Advocacy web site www.bonza.com.au (Baby Boomers of NZ & Australia) and have been in the role for over 20 years. During that time, I have continually identified the priorities and the beliefs of my generation through one to one meeting, large public gatherings of over a thousand at Expos and Centrelink presentations, emails to the web site from readers and supporters and on-line votes on the web site and therefore have accessed many thousands of them on many issues affecting Boomers including the issue of Voluntary Euthanasia. Data from the on-going vote on the issue, which is located on the web site, has it as 80% in favour of voluntary euthanasia of hundreds who voted. That figure if projected to all Australian Boomers could mean that 4 million of the 5 million Boomers would agree with voluntary euthanasia which is a resounding yes vote. It is not an issue that causes great debate among the younger generations in my opinion because they are too busy discovering the wonders of this world of ours, but more of an awakening of human empathy for those who have had to deal with it with family and friends as they approach palliative care due to terminal illness. It takes a great toll on you personally to watch someone you love to die in pain without much human dignity and you have to ask yourself why it couldn’t be different. Elayn's "bleak and desperate death" opened Nikki's eyes to the euthanasia debate. The author penned a column for The Australian about the shock, the grief and the overwhelming guilt she felt after her mother's death. "[It] broke our family," she wrote. "I felt skinned, felled by vulnerability and a sense of failure; a danger to myself and others. Was this very modern death empowerment or despair? Selflessness or Selfishness?" "If only we could have been there, if only we could have held her hand. It could have been so different if we could have just surrounded her with love," Nikki said of her mother's death. We age, I believe, in three stages. Stage One: Over 50s who suddenly realise that they are being treated as seniors and are introduced the first time to ageism when they are the brunt of the jokes. Stage Two: Over 60s who see the finishing post for work and are in a mad rush to gather superannuation. It is about this time for most that their parents start to enter the sick to terminally sick stage and they are responsible for their welfare and the process of their palliative care in many cases. Stage Three: Over 70s to death when the body is rapidly deteriorating, and friends and siblings are dying around you and you begin to worry about how you will die when your turn comes. It is in these last stages of life that people become more aware of their mortality and when their health declines then voluntary euthanasia becomes more relevant. We want to die with dignity and not be a burden on society and surely it is our right to decide how to die. I have no problem with the fact that certain religions would frown on the act but if the majority are in favour then we should make it our own business and make that decision personally without the beliefs of others condemning us to an undignified painful death. Indeed, what a difference it would make to our society if we could gather our families when we are told no more can be done for our health and enjoy their company one last time before we entered a room for our passing with the assistance of an injection. 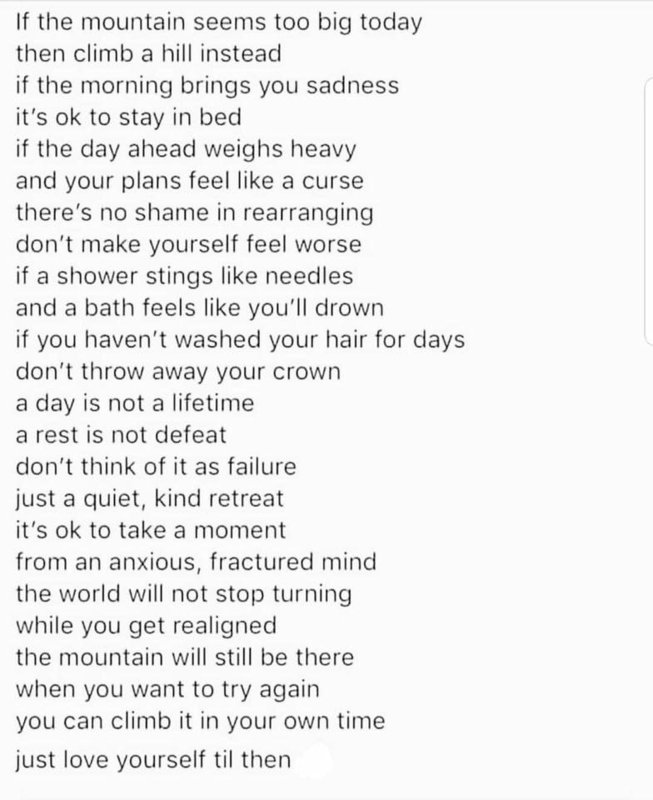 The positive memories that process conjures surely far outweighs the ‘dying surrounded by loving family’ scenario that leaves out the agonised and terrified soul in the bed who probably hasn’t uttered a word in days. Marshall Perron's (Former NT Minister) Open Letter on Euthanasia also moved me and defines the big picture so well. I believe there is an unrecognised phenomenon in Australia that should be of concern. I refer to the growing incidence of rational suicide by the elderly and the terminally and hopelessly ill. This letter is being sent to all state and Territory coroners to increase awareness of this important issue. Australia has an ageing society. While lifespans are extending, death itself is increasingly the result of debilitating degenerative disease of mind and body. Medical advances provide for dwindling life to be sustained until medicos allow death to occur. Terminal sedation, the standard response for intractable symptoms, is common and considered undignified. Some people are determined to avoid spending their final months or years as a demented patient. More and more Australians are rejecting this period of futile suffering and exercising autonomy over their own death. While many such suicides are understandable, I contend that some of them would at least be delayed, or even not eventuate at all, if the victims were able to seek and receive assistance to die from others. A result of being denied assistance is that many of these deaths are unnecessarily premature, lonely and violent. Premature because the individual has to act while they have the physical and mental capacity. Lonely because the individual is aware that assisting a suicide is an offence and they do not want to implicate family or friends. Violent because they must use whatever means to die they can access. There is a high level of interest in learning how to die peacefully and importing illegal substances to achieve that aim. I suspect you regularly receive reports of deaths where evidence indicates the individual was terminally or hopelessly ill and considered their life was (or will become) unbearable. Providing the person was competent and acted without coercion from others, the event can be considered to be a rational response to their circumstances. The number of rational suicides known to individual coroners is certain to be only a fraction of those actually taking place. ABS and other institutions acknowledge that suicide is (and has always been) under- reported for a variety of reasons. One that is particularly relevant in cases where the individual is terminally ill is that death by inhaling inert gas is undetectable if the apparatus used is removed (illegally) before the body is 'discovered'. Death is recorded as being the result of natural causes and as such, not reportable to coroners. There is anecdotal evidence that such disguised deaths occur regularly in Australia. What we do not know is the number of unsuccessful attempts at rational suicide; cases where the individual botched the process through inadequate investigation, preparation and/or failure of equipment. Having to act alone can be fraught with difficulties. The vast majority of rational suicide cases are known only to the immediate family. The public, policy makers and politicians are blissfully unaware of the scale of the distress, and will remain so without the official watchdogs, coroners, exposing what is happening behind closed doors. I contend that when investigating a suicide clearly related to voluntary euthanasia, a coroner should consider and report on whether he/she believed the person was motivated to kill themselves while they maintained the capacity to do so, and that in all probability, if they believed they could lawfully receive assistance to end their life at some later point in time, the person may well have deferred their decision to die. It would seem this evaluation and conclusion could be undertaken under the 'why' heading in the list of objectives of the coroner. Additionally, in the case of a violent suicide (e.g. firearm, hanging etc.) the coroner could also consider whether the act would likely have been less violent and thereby lessen the anguish for family and others involved in the aftermath, if the person had lawful access to a more tranquil way to take their own life. Reports of double suicides, murder suicide or attempts at such actions are occasionally reported but may not be infrequent. Where these appear to be motivated by fear of losing control over end of life decisions a coroner could, as a matter of public importance, consider recommendations that will help prevent or reduce future deaths of a similar kind. It is surely in the public interest that violent suicides are reduced and rational suicide delayed, even if they cannot be prevented. Rational suicide exists, it is time we acknowledged it officially, defined it and quantified it. I would urge all Queensland politicians to vote with your conscience and for the greater good and make voluntary euthanasia a reality in this state. Interesting how life changes when we become a pensioner and how much more careful you have to be with your money if you want to live as comfortably as possible in your golden years. We all miss that workplace income and find it difficult to survive without it. The reality of life in 2018 is that the average woman lives to 84 and a man to 80. You need approximately $20000 a year to live comfortably as a single pensioner and around $35000 for a couple. God knows we would all like more to do more financially but we are talking realities here as the pension is still around $20000 with no superannuation. Thank heavens I have some. So how do you get your dollar to stretch more so you can make the eighties deadline (forgive the pun) in some style? I am not going to go into specifics as we all have a different income, assets and budgetary requirements so I will generalise but the key is pensioner discounts. I save hundreds of dollars a year now on some bills by using that ace when negotiating but you have to ask. One sentence is compulsory every time you are buying or financially planning- do you give age pensioner discount? Rego, transport, electricity, water, rates, movies, take-way, coffee, medication, some shops ... the list is endless. There are around 8 million of us over 50 ... one third of the population and half of that 8 million over 65 so we are important to the economy and worth discounting. My financial planning includes part pension, superannuation, part time work and DISCOUNTS. I am going okay and hope that will be the case until my deadline so do your most to benefit from being an age pensioner. Happy golden years to us all. Is their a Hidden Tax on Baby Boomer Super? Went to visit the FIS (Financial Officer) at Centrelink about my superannuation. Wanted to know if it was better to take it as a pension or withdraw the investment gain only as it accumulated and leave the lump sum there. He advised me that the government take 15% of the accumulating investment each year as a tax without informing me and it is not recorded in the transactions on my super website home page. His advice was to open another investment account with the Australian Super (minimum $50000) and use the current account as a pension account (must keep 5% in there) and withdraw a set amount regularly. So talk to your super fund (mine confirmed that they do take the money each year without record (much to my dismay) but make a free appointment with the FIS first. My super offered no advice when I spoke to them just confirmed that it was correct. You can pay for an appointment with one of their financial advisers if you like after the FIS appointment. I still think it should be recorded somewhere that this amount is being deducted. A bucket list of things to do is a Boomer priority but there are moments when we will be challenged. Where can Boomers travel in safety? Just completed (Feb/March 2016)the Milford Track walk (over 100 000 steps on my Fitbit) and saw some pristine country that is hard to describe. A mixture of enchanted forest (everything covered in moss) to bubbling streams to rainforest ..all on day one. Then mountain terrain with huge boulders from the ice-age on day 2 and back to 21 km of first class scenery on day 3. Just marvellous..finished with a trip around the Milford Sound. Put it on the bucket-list but you need some fitness and a wish to enjoy life. It is demanding and challenging but so enjoyable. The guides were non- intrusive but kept a well-oiled infrastructure working and at night you socialise with 50 others that share the experience with you (unless you want to be an independent walker and take in all your own resources) but I enjoyed a hot shower and comfortable bed. Spent some time in the Northern Territory. My better half is very budget minded when we plan a holiday so I thought it might help others to pass on how we did it. The Territory can be seen within a few days or a few weeks depending on what you have in mind. There are two seasons- wet and dry- and you can forget touring in the wet season- Nov to Feb as even the markerts are closed and much of the area is shut down. We hired a car to do it- Toyota Yarris- and it was a pleasure to drive. You don't need a four wheel drive unless you want off road but we did the triangular from Darwin to Kakado to Katherine to Darwin via Litchfield National Park and really enjoyed our holiday. Hire the car through the NT Tourism site and you get unlimited mileage whereas it is restricted to a few hundred if you hire direct from the car rentals. Loved Kakado for the scenery, indigenous heritage eg rock paintings and the Jabiru Tourist Park which was like and oasis with their lovely pool and dining outdoors.Had a meat lovers pizza with croc, buffalo and roo meat. Katherine was dry but has a magic natural springs area which the City Council has developed and is worth a swim in the crystal clear water. Katherine Gorge is unbelievable. Walk up to the lookout before you take the boat tour as it is breathtakingly beautiful from up there. The boat tour is a must and the gorge itself is an Aussie treasure for its beauty and history. So old that there are no fossils as the earth didn't even have plant life then. Saw crocs bathing on the shore as we passed up the gorge. Darwin has Sunday food markets at Mindl Beach, the war museum, botanical gardens for many different plants (NT is really another world compared to other parts of OZ for plant life), outdoor movies, fantastic harbour precinct, great walks and bikeways and very friendly people. All in all it was a great holiday and we also enjoyed Adelaide but will be back there when we do a campervan tour in September from Perth to Adelaide. More then. Are you an Australian or Kiwi Baby Boomer with a story you'd like to share with our online community? Email our editor at brian@bonza.com.au and you could have it published on BONZA.com.au! 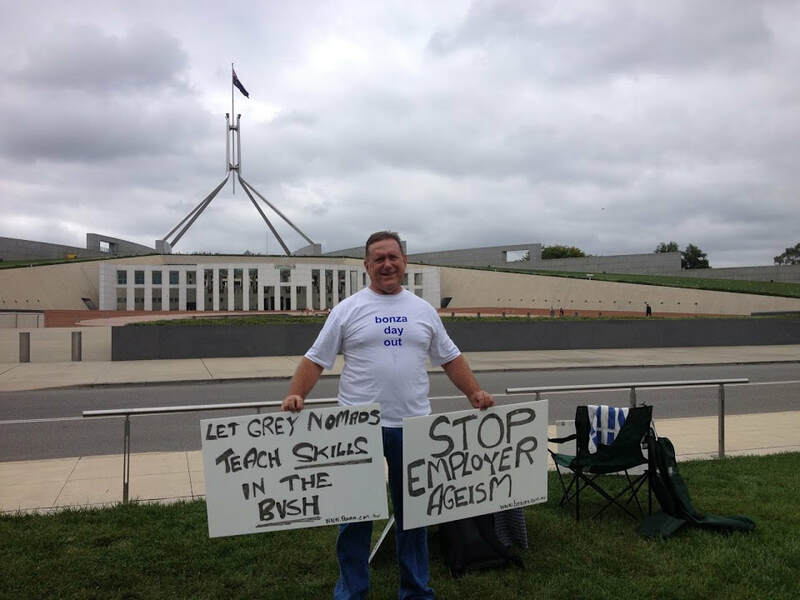 Approach Bligh Govt in 2011 to introduce Bush Skills project through Regional Councils ( Grey Nomads to be trained in Cert 4 T&A to teach skills to young people in regional and remote centres as they travel around Australia) and gain approval to develop program. Floods drain all allocated money and project cancelled. Ciobo takes submission to Shadow Minister Bishop and suggests Boomer ideas could be added to LNP Ageing Australia policy for next election but he has to go to Washington on secondment so no response other than funding not available. No other feedback. BONZA Report based on collation of Boomer suggestions over 14 years is released in 2014 and sent to all Federal bureaucrats, local members, PM and Qld Premier. Several thank you letters in response. The Intergenerational Reports predicted skill shortages aren't happening and with mining no longer chewing up the workforce then there is a need for new ideas for the mature age job seekers urgently. Work creates superannuation and with an average of $60 000 in super now then Boomers aren't prepared financially for the future. Lots to do folks,so let’s get on with it in 2018 and have a BONZA LIFE! Imagine a society without our police. I know the answer to that because we couldn’t function without them and yet we rarely get to thank them personally for what they do. National Thank A Cop Day is your opportunity to make them feel valued and loved. On the 19th September annually is the community’s chance during Police Week to personally thank each and everyone of them. Stop them in the street and tell them you appreciate them, send flowers or a pizza to the local cop shop or just a simple thank you as you pass by them doing their job is a start, but it is up to each community or individual. I am sure you can make them feel loved in many ways, so we invite you to start planning and please let us know what you will do. In recent times there is ample evidence that they are doing it tough as the job becomes more demanding and individuals lose respect for them in aggressive ways. (See photos above) They need to be reminded by us and not just by receiving government medals and awards. I personally feel that our sincere thanks will mean more to them than any award without being disrespectful but that is just my opinion. Each state has acknowledged, offered support or encouraged the day as a worthwhile community initiative through their Police Ministers (see example below) but the support must come from us, so they don’t have to do anything but feel the love. Could you please start planning what your community could do through your workplaces, organisations, sponsoring or highlighting the day so that we are all aware of it and respond accordingly on the day. I am senior adviser to the Police Minister in the Victorian Government, Lisa Neville. I wanted to reach out to offer the support of our office in helping promote next year’s Day. If there’s anything we can do to support, the Minister is keen to be of assistance. Look forward to working with you all to make the day very special. One of those more interesting phrases used by our football commentators would describe what happened to me today. I dropped into my favourite coffee shop Jekyll and Hyde for the daily cappuccino (voted best coffee on the Gold Coast reads the sign over the counter) and I had a read of the free paper they supply. Now I know tabloids are almost dead as was witnessed when I flew to Melbourne on the weekend. Ten years ago, there were newspapers being read all over the cabin and free ones as you boarded and discarded papers all over the seats as you left the plane. No more I am afraid so it’s like a trip into the past to be able to thumb through one and to be honest brings back fond memories. My father read newspapers from back to front and then my mother would check out the advertisements and the death notices and engagements to see who had left us and who had taken the plunge into family life. Then it was birth notices and engagements, so the old tabloid got a good workout back in the day. I am a slave to my phone now for ABC news, Huffington Post and other more credible media sources to flit through the news so times have changed. The six o’clock news is even off my list now as it’s all bad news. Anyway, I am digressing. I was sitting drinking my coffee and relaxing when I realised Sonny and Cher were singing in the background music. Now the Jekyll and Hyde is a modern coffee shop run by a couple of switched on Kiwis and has ultra-modern décor to attract the younger crowd so I was a little confused but I overheard a conversation when someone asked why the choice of music and the answer was that it is better received by all as more relaxing. My mind was wandering back to another time and thinking all things déjà vu when I recalled that my 24-year-old son told me recently that he had just completed listening to all the Beatle albums and to quote, “There is some great music in those albums dad”. As if I didn’t know being a number one Beatles fan but I never thought he would indulge, and I am also intrigued how well Bohemian Rhapsody was received in the cinemas lately. Queen were never as popular with my generation as they are with this one. For instance, after Sonny and Cher today came Queen’s anthem song from the film and the shop was rocking. Staff were singing, and customers were swaying to the music (my foot was tapping as I am not a performer…. well not much of one). I am an optimist though and a raging idealist, so I can only hope that this fondness for déjà vu will take a huge step and impart on the next generations life and we can get away from reality TV, online games and egocentricity and find the old world of caring, supporting and talking to each other. Wouldn’t that be nice. NEW GENERATIONS REQUIRE NEW LAWS TO REFLECT THE SOCIETY OF THE DAY. My elderly mother in law had her phone cut off last week on the Monday by Telstra - her one source to the outside world cut off. She lives in community housing with no car and cannot, like many of her generation, grasp using a mobile phone. After complaining to Telstra Customer Service, I was told she would be given medical priority as she is a risk from frequent falls and is currently suffering a black eye from one. She takes anti-depressants, blood thinners and various other medication. As a DV sufferer, she goes to a health professional to talk about her stress and post traumatic memories and they phone with appointments or she may need to phone us in an emergency. Oh no, I was told, someone would have had to have her personal details and gone online to request the connection go to another provider otherwise it would be illegal. This woman has not installed Internet because it would be a waste of money as she would not use it, so I knew that what they were alleging was incorrect, but I was reassured that they have their top people on it and would be reconnected quickly. I might add here that this ridiculous practise of having to verify your personal details when Telstra phone you is out-dated as it is a favourite scam now by criminals to pinch personal ID’s by phoning people and telling them that you are from the Tax Dept or Telstra and they require your details. So, three days later an email is eventually sent by Telstra reconnections to say that the phone will be reconnected to unit 1 at her address, supposedly good news from them accept she lives in unit 8. After telling them the problem of the wrong address in the hope it was a typo, I was told they would investigate it, but we may have lost her connection to the new provider and they could not get it back unless she went into the nearest Telstra office and gave permission for it to be swapped back to her. I explained that she had not given permission for it to be disconnected so why would she need to give permission for it to be reconnected. By Thursday I was worried as it was nearly the weekend and four days of investigation had not produced any results, but I was told, “we are working on it”. By Friday morning she went to her medical appointment but was told that it had been cancelled as they could not contact her to verify she was coming as is the usual practice. Telstra was told this but still could not promise that it would be reconnected or when it would be but were still giving it urgent attention. Finally, a call late Friday from them came to explain that the phone could not be reconnected as it needed to have a modem now even for phone connection even though she was not going to have Internet installed. The Telstra NBN guys would contact this week to make an appointment and would install it and then reconnect the phone. It is Monday evening and still no call seven days later. I would imagine you are speechless as I am. I have never seen such incompetence and is really neglect of the elderly which brings me to the topic of this article. New laws and services are needed for new generations. My wife and I have been conversing with Telstra but what about the millions of ageing Australians who would have no idea nor the skills to rectify such a monumental stuff up. As BONZA has been highlighting for 20 years, there is no previous game plan for Ageing Australia as it is the first time in history that we have lived so long. Average age for death now is in its 80s so the laws and rules must be adjusted or rectified for mature people. Governments normally have some previous legislation or practices to refer to, so I get it- it is difficult for all, but we can’t keep this incompetence up. We need better service from large companies like Telstra and even government centres like Centrelink. Several million elderly will never learn IT and that is a fact so should they be ignored. I think not. There must be trained mature age representatives across the spectrum of daily life who understand the needs of the elderly and can assist them genuinely and with patience and compassion as there will be one in four people who are mature aged. Finally, there are many laws to consider changing for the elderly such as traffic, driving, security for women, ageism, elderly abuse for a start but the most pressing and important is voluntary euthanasia. We all deserve the dignity of knowing that when our time comes, we have a gathering of the clan to say our goodbyes if we wish and then press the button to end our time on this earth. Push for some changes Boomers. We never accepted bloody-mindedness from governments in our youth so rekindle that passion now and press for change. I have always spent the last months of a year looking back on my achievements and challenges from that year both personally and in the workplace. Nothing is different now as we prepare to enter another year of work and family life. Indeed, as a manager in the past, I sent at least a half day with staff in late November allowing them to highlight at a planning session, what they believed worked and what didn’t with our team in that previous 12-month period. I also encouraged in that planning and refection session for them to suggest ideas for the future and once we had collated those ideas then to decide which three would be the focus for the next year along with current practices that were working for them. This was accomplished by placing a 1, 2 and 3 preference beside the three they chose so that the most popular votes in terms of votes were accepted by all the team as our focus for the next year. I know it worked for me and my teams in that they all felt strongly that they were being listened too and were part of a team focus during an individual feedback interview with them after the planning session. This allowed for a much happier and focused group who loved coming to work. My family also were subject to somewhat the same process when we talked over the Xmas and New Year period so that we all had a say about what worked and what didn’t as far as activities, family chores, outings, budgeting and social interaction in the previous year and what we would like to keep or change in the new year. We all need to take active listening (only one person speaks at a time) and planning very seriously in our home and work environments so that, as we enter a new year, it is with the passion and excitement that there will be change in some form, otherwise we are guilty of making the same mistakes and doing the same things each year which can only produce a boring and frustrated workplace or a bored family. Strap yourself in because here we go into another year of intrigue, discovery, disappointments and gains in this game called life. Good luck all. I didn’t make any resolutions myself this year in fact I was in bed by nine. Boring old fart maybe or just content with life and not wanting the pressure and anxiety of breaking them as per normal. Not sure about resolutions but I did think about what positive things I would like to see happen in 2019 before I succumbed to the zzzz’s. All states, in my opinion, must give the nod to voluntary euthanasia as Victoria has done please. Well done to the Mexicans in Victoria I say. The Banking Royal Commission must recommend sending the crooks who ripped us off for years to jail. No different to robbery so make it happen. No more hidden costs and fees from financial institutions with loans and superannuation as well. Everything upfront and visible please. All workplaces introducing a MAP (Mature Age Policy) which outlines (after discussions and input from all players) a policy to encourage older mature workers (super adults) to stay at work with a changed agenda. Shorter hours, mentoring of younger generations, shared work time with colleagues, time off without pay if beyond accrued leave for travel and whatever else you want but make sure you feel wanted and important in your workplace. Hope too, you all have plans for exercise and eating smaller portions which will benefit Boomers greatly. My last thoughts New Year’s Eve were for Boomers who are ill. My hope for them, in an ever changing and positive world full of research into nearly all our ailments, is that they find a cure to keep us alive and healthy. A lovely lady I know was told last year that cancerous tumours would end her life very soon. She took the gamble and entered a research program at Greenslopes hospital that required injections each month that would have cost her thousands of dollars per injection. She has informed me that her new year check-up has cleared her of the tumours. Wonderful time to be alive folks and many of us will benefit from this worthwhile research by the medical profession. Never give up hope this year or any year in the future and have a BONZA life. Don’t forget to have some fun and travel as we were too busy when we were younger. Sandy is a Baby Boomer. She is 65, divorced with no children and lives alone in her unit she owns. Bonza asked her how she felt about her future knowing there will be hundreds of thousands of single women over 60 in Australia in the next decade who will become the focus for government concern about their futures and her first comment was how lonely it was around Xmas for her. The government is already aware of the magnitude of the problems this group will bring and are planning ways to secure their safety, enable them to socialise, providing them with age care accommodation, allowing for their diverse health and fitness requirements but it is such a diverse group to plan for in reality. Many, for instance, have never worked because they were stay at home mums, so they have no superannuation. (We all accept they worked very hard with daily family routines in this period of their lives but for no financial reward). Some of this group are already widows and struggling to make ends meet. Those who have worked and are divorced may not own their home now and to remain financially viable over a few decades then you will need to. At least they may have family to take them in in their declining years and care for them even if reluctantly. Some have never had children due to medical reasons or by choice and will be ageing without any family support and living on the pension only. Sandy spoke with us and gave us an insight into her anxieties and concerns knowing that her current situation may assist others with their plans and could also influence government thinking and policy as BONZA continue to advocate for all Boomers and for this we are very grateful. She is also isolated in that poor fitness does not allow her to be involved in physical activities and some poor self-esteem means her face to face social life is minimal. She visits her local restaurants for special dinners, consumes a little alcohol, is unfit and lonely and is also a prime target for unsavoury characters in the community whenever she is out and about. It will only get worse as she ages and even though she is young at heart, her body will break down over the next decade as she enters her seventies. Knowing all this, we asked her who will look after her and what are her options as she ages? ​ BONZA is aware that many over 50 establishments would be a suitable destination now while she is medically able and that would give her a social life with her peers, but she is reluctant after seeing their contracts. The units in these establishments are expensive also so if she can’t afford one then maybe a shared house or unit with someone in the same situation where costs can be shared would be an option for her. Woman should also talk to the Centrelink Financial Officer(FIS) about their finances, so they can ascertain what is available for them. It is a free service and will put your mind at ease. She wants to maintain her independence by staying in her unit for as long as possible, so this must be respected as it is her wish and right. Finally, it will become a government issue and priority in our opinion to build suitable aged care hubs where the women can be housed securely and maybe have medical centres attached for their long term medical requirements and include fitness classes, so people can stay healthier for longer. Keep having a BONZA life Boomers because Ageing Australia will not be a bed of roses for many of us. 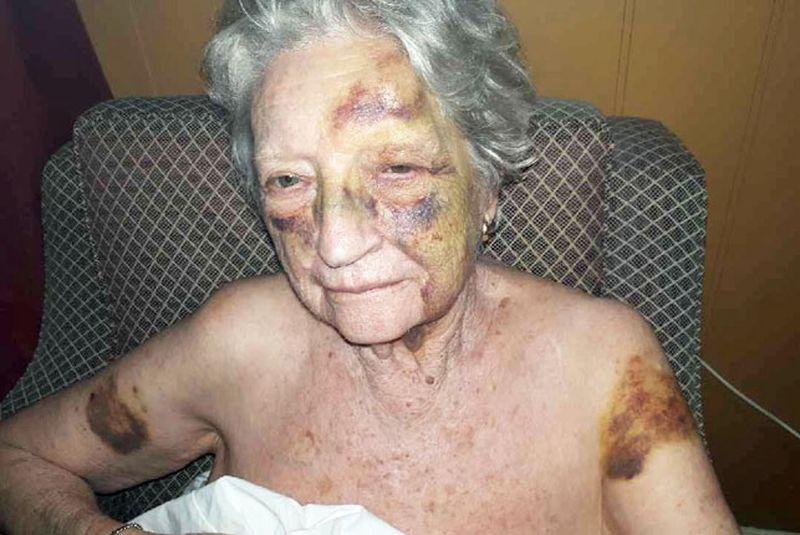 Thousands of you were upset by this picture of a lady allegedly attacked by staff in a nursing home that we placed on our FaceBook page and expressed your outrage. There will never be a trial as she has dementia but I think we all saw a little of ourselves in this and have some concern for the future. There will have to be repercussions..hopefully a Federal inquiry into the aged care industry and as an advocacy for all things about Boomers, BONZA encourages you to talk about how wrong it is to friends, family, social media and letters to the editor of your local media outlet....don't forget you members of parliament and don't give up..its your future so make a difference. This is a story that happened in Spain on the 29 th May 2016. My mate Keith Blake was travelling with his wife Sally and he sent me this on Facebook. They were attacked by two young men. We then walked through The Ravel to the top end of our street, but just before we got there we were approached from behind by two young blokes offering discount tickets. I was carrying my camera in one hand and the shopping bags in the other but one of them thrust a card at me and I grabbed it. He then grabbed me and swung his body around me, lifting my wallet from deep in my front pocket. In one move he swung around, still holding on to me and passed it to his mate. This is where they came unstuck. Sally was beside me and immediately put the second guy in a headlock, and screamed "Thief, Thief!". I flung the first guy off me and grabbed my wallet out of the hands of the guy in the headlock. No. 1 thief scurried off and so did No 2 when Sally released her grip. People came running to see if we were alright, but they should have been more concerned for the two would be thieves. Never pick on two grey haired Aussies, especially when one is Super Sally! Lesson learned for two young tearaways!! Boomer Reunions.. Is it Time for Baby Boomers to Reminisce? BONZA organised a high school reunion around 10 years ago and we had 600 fellow high school Boomers attend..just for the one school Indooroopilly High in Brisbane but it was great to invite 10 odd years of ex-students as you saw faces from the years before and after your year..ex army cadet leaders, prefects and sportsmen and woman who made school life so vibrant. Ex teachers were also invited and many were cheered as they spoke to the crowd. I really enjoyed it and recommend it to you all..gather some ex classmates and reminisce to your hearts content. In the last 10 years I have tracked down and met many old friends who I had lost contact with in the frantic pace of life for coffee..work and raising kids in particular use up so much of our lives and I felt a need to see them again. Join our BONZA Facebook today! Check out these great reads from BONZA!